Are pests causing issues in your landscaping? Pests can ruin a perfect landscaping project by eating through your plants and damaging your trees. You might think that extermination using pesticides is the only option, but you couldn’t be more wrong. Calling in the pesticides can be very harmful to your landscaping, but don’t worry. You have other options that will help manage your pests without harming your yard. Are you ready to learn more about pest control that will save your landscaping? Let’s do it! Help the good bugs while deterring the bad ones. Some of the bugs in your garden are actually helpful to the growth. Bumble bees, for example, help keep your flowers pollinated. They’re also good for vegetables and fruit plants. Using a pesticide would harm these helpful bees. This is actually a serious issue throughout the country, but you can help by using safe pest control methods. 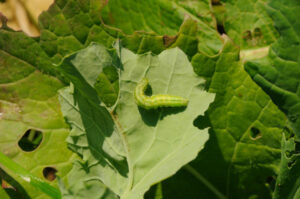 You have several options for organic pest control. Firstly, you can simply call in a professional. These pest control professionals will be able to assess which bugs are causing you trouble and the best way to naturally deter them using the Integrated Pest Management (IPM) methods. These methods are completely harmless for your garden and won’t harm any pets or helpful bugs in your landscaping. You should also consider simply hand picking some of the bugs right off of your plants if you can stand it. This method works to ease the strain, but it simply fixes the issue short term. For longer results, you may need to concoct a repellent made of natural ingredients. You can do this using a wide variety of methods, so get ready to experiment. Need professional landscapers to help you achieve your dreams? This entry was posted on Wednesday, July 22nd, 2015	at 7:26 pm	and is filed under Landscaping Maintenance	. You can follow any responses to this entry through the RSS 2.0	feed. Both comments and pings are currently closed.